I had never heard of the Rule of 55 until a couple of months ago when a Certified Financial Planner (Jim Blankenship, CFP) mentioned the possibility in a discussion forum I frequent. I'm not an expert on this rule (or any IRS rule) but here's what I've learned about this penalty-free method of taking a 401(k) withdrawal. roll the 401(k) over to an IRA. I omitted the possibility of taking a distribution now because that way horrifies me for many reasons including the tax penalty on early 401(k) withdrawals. What ensued in the discussion forum was a debate about the merits of 401(k)s compared to IRAs. Many insisted that IRAs were always better than 401(k)s because of fees associated with employer-sponsored plans. A few others, like me, defended the 401(k) because of its special features and the general caveat that the right move depends on the particulars of an individual's unique circumstances. This argument is similar to the one regarding student loans: you may not want to consolidate, refinance, and thus reclassify federal loans to a private status because you'll lose special benefits, such as the ability to defer payments while you're unemployed — even though there's a possibility that you'll get a better rate. The idea here is to look at the obvious comparisons (investment fees and interest rates, for example) and consider features that could save money under certain circumstances. For example, keeping money in 401(k) rather than a traditional IRA may be advantageous taxwise if you happen to do a Roth IRA conversion. Schwab has a calculator to help you see the impact of non-Roth IRAs in the conversion. Mike Piper, CPA and author of the Oblivious Investor, explains this rule and references the IRS tax code that mentions this exception to the 10% penalty in a blog post. He also clarifies that you can't quit at age 50 and expect to get access to your money free of tax penalties at age 55; you've got to work for the employer with the 401(k) until you've come of age at 55 years old (or turn 55 in the year in which you become separated from your employer). You can find an explanation from the IRS on this topic here. Note that you'll still have to pay regular income taxes on withdrawals. In addition, your state's department of revenue may have different rules about early withdrawals than the IRS. Further, I'll mention that your 401(k) plan administrator may not allow this distribution or may require you to take a lump-sum distribution, resulting in a higher-than-expected tax liability than you'd anticipated. So, even though the IRS allows the withdrawal penalty-free doesn't mean that you'll automatically gain access to your money in the way you desire. You'll need to check with the plan administrator and plan documents to be sure. Another point of mystery is whether you can access funds from multiple 401(k) plans. Piper states that you can access money from any 401(k) plan in which you were displaced from the sponsoring employer at 55 or older while other sources have argued that you'll only be able to get money from the most recent employer. This nuance in interpretation leads back to the original discussion. One option for dealing with an old 401(k) is to move money to the new 401(k), from which you may be able to withdraw money when you turn 55. The main point is that you may have this early distribution option with a 401(k) — or a similar ERISA-qualified, employer-established defined contribution plan such as a 403(b) as Jim explains in his article on this topic — but not with an IRA. So, if you plan to retire early or earlier than 59.5 years, then you might consider keeping money inside the 401(k) plan rather than doing an IRA rollover. To decide on the approach that's right for you and understand how the rule of 55 might apply to your situation, consider consulting with a CFP and/or tax advisor. Who do I call to cash out my 401k? There should be an administrator associated with your 401(k) plan. This person or group should be able to answer questions and help you complete transactions. I have a 401 k which I owe the amount of 9,600 from 24,000, but unable to pay back my loan for personal reason and now I am laid off my job after 13 years. I know if i withdrew the remaining money i am subject to regular taxes and penalties. Is there an exception from paying the penalty if i am 57 and laid off. Your 401(k) plan administrator and tax professional (and/or the IRS) may be able to help you determine how the Rule of 55 might apply to your situation. I will be 55 this year and my job has gotten to stressful and it is starting to affect my health. With. That being said I am thinking of retiring at the end of the year. I have had this employer sponsored 401k for 14 years. Would I qualify for the 55 rule and be able to draw my funds without penalty. I am in Louisiana. You’d likely need to talk to your tax professional and 401(k) plan administrator to determine how the Rule of 55 might apply to your situation. I retired early last year at age 57. I will be 59 next month and may need to take a $10,000 to $15,000 early withdrawal from my 401k (not rolled over to an IRA) this year. I know I will need to pay taxes on this distribution. But, under Rule 55, can I take this early withdrawal as a lump-sum distribution (versus a series of equal distributions for 5 years) and avoid the 10% penalty? I’ve never done this type of withdrawal myself and I’m not a tax expert but it sounds like there’s a possibility you could take the withdrawal without incurring a penalty. 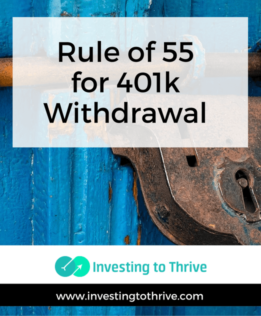 You’d need to check with the plan administrator of the 401k plan to determine whether the plan allows this type of withdrawal. You could also check with your tax professional or IRS to verify that you can take the withdrawal and skip the penalty. I’m in my late 30’s and have a sizable 401k with my current employer, who is being bought out by a larger enterprise. I’m thinking of rolling over my existing 401k to my new employer, so as to capitalize on the rule of 55. Or I was thinking of rolling over my existing 401k to a ROTH IRA so that I can choose more specific mutual funds to invest in, and tap the 401k of my new employer when I retire at age 55, so I’ll have two investment paths for retirement. I think the rollover is the more conservative approach since I’ll be forced to pick broadly diversified funds. If I rolled over to Roth I may be tempted to be too risky. Options options. I’m glad you have options. Kudos for accumulating a sizable 401k in your 30s. A few more things to think about: If you rolled over a traditional 401(k) to a Roth IRA, then you’d owe the IRS some money on the rollover. Also, some 401(k) plans may offer lots of choices though your new employer’s may have limited ones. Lastly, I’m not sure if you could split your 401(k) — sending some to an IRA (where you’d have more control over investments and the money in general) and some to the new 401(k). I’m not a CPA or CFP and am not sure of all the tax impacts, plus various 401(k) plans have varying specifications that requires scrutinizing plan materials. But this could be a great time to do more research or consult with a professional. Best wishes on your next steps! I’m not a tax professional, investment advisor, or 401(k) plan administrator — you’d need to consult with a professional to determine whether you quality for the Rule of 55. But if you could, based on my understanding, the same rules of withdrawing at retirement age (59.5) would apply. I am eligible for the age 55 rule, and have taken advantage of it. I also took a new job and max out that 401k. The new 401k’s options are not as advantageous as the old, and would like to roll the new into the old “age 55” fund. Does doing this ruin my age 55 exception? Great question Mark and I’m not sure how rolling the new into the old would affect the application of the tax law. You’d need to ask the IRS or your tax accountant to get clarification. The intent behind the rule though is to waive the early withdrawal penalties on funds being withdrawn from a 401k associated with a company from which you’ve separated, but not from the one you’re still working for. As you get closer to 59.5 years (when the rule of 55 doesn’t matter so much because there’s no early distribution penalty), the situation could change. But again, talk to your tax pro as this isn’t my expertise. I’ll note that company guidelines associated with 401ks (in addition to IRS regulations) can impact what you can and can not do. Hope this points you in the right direction. I have a regular IRA (which I’ve rolled a few old 401Ks into over the years). I have a larger (2X) current 401K from my current employer and will turn 55 in the next calendar year. I’m considering leaving my current employer in the next year. Can I roll my old IRA into my current 401K and then take early distributions from this entire 401K amount in the year that I turn 55? Or am I limited to accessing only the uncomingled amount that is due to the current employer 401K only. If I can take distributions from the merged amount, are there any IRS rules around how long the IRA funds need to sit in the 401K before I access them? I haven’t been able to locate any IRS rules relating to reverse rollovers (IRA to 401k) and Rule of 55 withdrawals. I suggest talking to your 401(k) plan administrator and/or reviewing plan documents to determine if the plan accepts IRA reverse rollovers. Then I’d speak with your CPA/tax professional to be sure you followed the rules for penalty-free distributions. I’m not a CPA and can’t advise on specific applications of IRS regulations. From a lifestyle/finance point of view, consider determining your cash flow requirements over the next few years (from 55 to 59.5). Will you need the IRA funds in the 401(k) before you turn 59.5? Are there other reasons you’d like to combine the IRA with the 401k? I find it helpful to map out the cash flow (withdrawals, taxes, etc.) to make sure I’m making the right decision, at least in terms of the numbers. Hope that makes sense.